In Upstream, Cook is that proverbial spotter, high above the Northwest, but he’s also boots on the ground and waders in the water. The book is an ambitious exploration of salmon country and the daunting physical and political challenges facing these totemic fish. Admiring freshly caught salmon at Seattle’s Pike’s Place Market, where the book begins, Cook reflects, “I understood that great runs of salmon had shaped this landscape as much as the glaciers and volcanoes and waves of new immigrants.” He sets out to see the extent to which salmon still shape the Northwest even as we shape them, making a pilgrimage into mismanagement and recovery efforts, past and present. 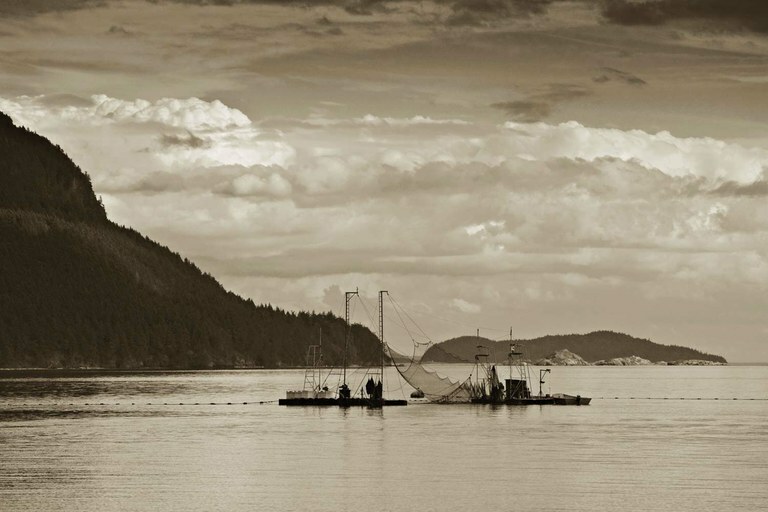 Reefnetting in Puget Sound, off Lummi Island, Washington, September 2009. Cook searches widely for answers. Though a fly-fisher, he deigns to troll a reservoir on the Columbia River, once “the greatest nursery on the planet” but now home to a place called the “Toilet Bowl,” where boats turn sad circles hoping for a hatchery chinook that’s topped Bonneville Dam. He attends a Native salmon ceremony in Cascade Locks and plies an unidentified river on the Oregon Coast with the director of the Wild Salmon Center, Guido Rahr, who believes that lonely, undisturbed streams in second-growth forests offer today’s best conservation opportunities. But, as Cook notes, “Money tends to follow the problems, not the opportunities.” Though $15 billion has been spent in the Columbia Basin since 1978, none of its wild strains of salmon have been removed from the endangered species list. 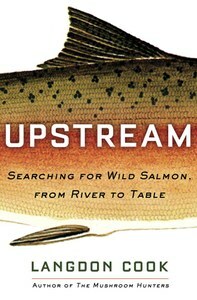 Upstream is first-rate literary journalism, a deep dive into surprisingly disparate milieus united by a passion for the king of fish. Cook pivots easily from place to place, and aficionado to aficionado. The characters he renders are both salty and refined, and the connections between fishers, farmers and conservationists are drawn taut, with real tension at times. Upstream is also a classic commodity narrative, à la John McPhee’s Oranges. We learn how Pacific salmon ultimately migrate to a fine restaurant or home kitchen, and we even learn the secret to preparing them: slowly, at 220 degrees. 336 pages, hardcover; $27. Ballantine Books, 2017.